Have your children ever dreamt about meeting a real life mermaid? Miss 3 did today because Mermaid Tarielle swam into Kilsyth Centenary Pool to meet her little mer-friends. Miss 3 loved it so much she wanted the opportunity to tell you all about it, so here is Miss 3's mermaid encounter experience, from her perspective..
Hello, I am what my mummy calls a water baby. I love it. If you ever see a kid paddling in the sea in the middle of winter, that's me. If you ever see a little girl going down the waterslides head first, there's a high chance that's me too. If there is one puddle in the middle of the park, I'll go dancing in it. That's me. Mummy told me we were going swimming at a swimming pool today. I couldn't wait because the pool and the beach are my favourite places to be. I got changed into my costume stepped out and I couldn't believe my eyes. There was a mermaid in the swimming pool! She was the most beautiful creature I had ever seen. Her beautiful tail shone so brightly in the water, it looked liked it was made of lost treasures of the sea. I gave out a squeal of excitement and looked up at mummy. Mummy beamed a big smile back at me and asked if I wanted to meet the mermaid. "Yes please," I shouted excitedly and climbed into the water. The beautiful friendly mermaid swam over to me and introduced herself. Her name was Tarielle and she answered every question I had about living under the sea and let me touch her tail. She had a magic shell. She told me if I held to my ear to her shell, I would be able to hear the waves of the sea. I did and I could! It must have been a magic shell from the land of mer-people! She then asked if I wanted to go for a swim with her. Wow for real? Tarielle and I were going on our very own watery adventure. I climbed onto her back and I held on tight as she swam so gracefully though the water. I let out another squeal. This was the best thing to ever happened to me in my whole life. I have had so many dreams about swimming with the mermaids and here I was doing it. My dream had actually come true. Mummy found out that Melbourne children can book a Mermaid Party with Waggle Dance. It isn't a lot of money either, from $190 you can celebrate your birthday with your friends and Tarielle will either appear at your chosen swimming pool or nearest beach; where ever you decide to have your party. I think she is the bestest ever. I hope she comes to my birthday party. 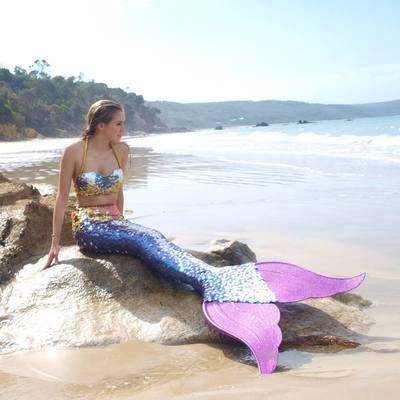 Book your Mermaid Party with waggledance.com.au and follow Mermaid Tarielle on Facebook to find out when and where she will next make a public appearance.